You can hold almost 3 cans of beer with this stein. Not sold yet? What if we told you that you can have your personalized logo added to this custom stein. This monster stein will carry all of your drink anywhere. The durable plastic will not break easily or break your bank at this affordable price. 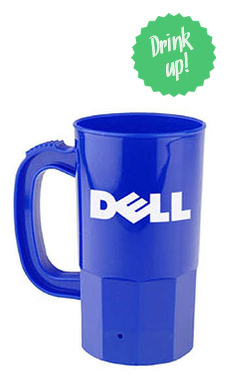 Imprint your logo in one or two colors on both sides of the stein so you can display your logo in either hand. Includes the plastic stein in your color choice with a one color imprint. Choose the right combination for your event. Your beer stein is proudly manufactured in the USA and is recyclable. Also comes in 14oz stein and 22oz stein.